During January, all Board Book Pack (10 copies) orders for Difference Makers: A Leader's Guide to Championing Diversity on Boards receives 20% off and free shipping when you order a Board Book Pack - click here. What's the book about? Difference Makers: A Leader’s Guide to Championing Diversity on Boards reframes the debate about who can participate in board directorship. Dr Nicky Howe and I share our experience developing the award winning board governance program for young aspiring directors and the research on how diversity can enhance problem solving, spark innovation and ultimately build better boards and organisations. The book includes: Tools and templates to make your board’s diversity journey easier and more effective Personal strategies to develop your own personal commitment to diversity Board strategies including how to develop a board diversity policy and enhance recruitment, nomination and meeting processes Real life case studies ...and much more! Reward your board directors! Reward your board directors with a small gift that supports their development and improves business outcomes. Interested? Order a board book pack for your board members in January and receive 10 copies of the book plus free postage for just $24 per book. That’s a 20% discount plus FREE postage - a saving of $80! Orders must be made before the end of January. 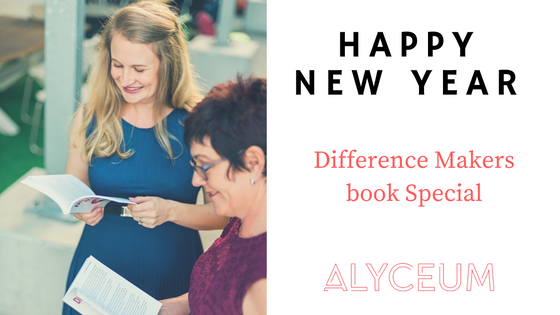 Difference Makers is a great addition to your board professional development program or a useful holiday reading gift! Order your book pack here. Just want to order a single copy of the book, click here. Alyceum is proud to be announced as one of Westpac's 200 Businesses of Tomorrow from over 2000 applications across Australia. As part of the announcement, the 200 businesses were invited to a Business Summit in Sydney with speakers such as Marc Randolph, co-founder of Netflix and David Lindberg, Westpac Chief Executive, Business Bank among others. I traveled over with my 6-month old son and my mum who cared for him so I was able to attend the Summit. Big props to Westpac too for making them feel so welcome. Talk about the new way of business! During the Summit, we explored future business trends, what it takes to be innovative and how Australia can further foster entrepreneurship. Here are some of my key take-aways: Marc Randolph, Co-founder, Netflix The innovation process is about your ability to have lots of ideas, validate them as quickly and cheaply as possible until you find one that sticks. Innovation needs persistence and optimism. Take your ideas and collide with customers. Panel Session with Mia Freedman, Mamamia, Dare Jennins, Deus Ex Machina, Rachael Powell, Xero and Andre Eikmeier, Vinomofo Attract your tribe through content that shows who you are. Technology can help you scale the human experience. David Linberg, Westpac Chief Executive, Business Banking Key business trends include running service based businesses, selling to (rather than buying from) China, automation and robotics, purpose in business, gig economy and changing demographics. Bernard Salt, Demographer Australia has the largest proportion of city population comprising of international born residents (Perth, 41%, Sydney 42%) Australia is not creating big businesses. All our major businesses where founded in the late 1800's and early 1900s (think BHP, Telstra, Wesfarmers, Woolworths and the Banks) compared to 5/10 of America's biggest businesses (Think Apple, Google, Microsoft, Facebook and Amazon) which were founded in the last 30 years. It was a fantastic Summit to meet inspiring entrepreneurs from around Australia and think about society will look like in 2020, 2030 and 2050. Thank you Westpac for the honour of being named in the inaugural list and for the Summit experience. Want to follow Alyceum's journey? Sign up to our Newsletter Register here and receive a free chapter of my book, Difference Makers: A Leader's Guide to Diversity on Boards. “If our hopes of building a better and safer world are to become more than wishful thinking, we will need the engagement of volunteers more than ever.” — Kofi Annan Is it your time to step up and gift your time and talents to a good cause? Being a Board Director on a Not-For-Profit Board is a fulfilling experience. You may be giving your time, expertise and networks but you gain so much in return. Over the past five years, I’ve been so fortunate to be involved in a life changing program called Engaging Young Leaders on Aged Care and Community Boards. Since the pilot program was funded by a Social Innovation grant in 2013, this program has championed diversity on Not-For-Profit boards. There is no other program like it across Australia! I’ve worked with, trained and supported nearly 100 young professionals to find board positions. I’ve been fortunate to organise site visits, hear from the most amazing CEOs and explore what it means to be an outstanding board director. In 2016, I co-authored the book, Difference Makers: A Leader’s Guide to Championing Diversity on Boards. These experiences have complimented my own journey on a number of Not-For-Profit boards over the past 15 years and my love of volunteering to community causes with a purpose to making the world a better place. “The best way to find yourself is to lose yourself in the service of others.” — Mahatma Gandhi Then the Board Ignition Course was born. 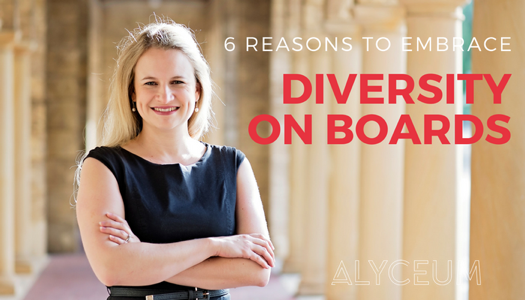 The Board Ignition Course challenged me to take my vision for board diversity to the next level. How can I support even more people - young professionals, entrepreneurs, young women, culturally diverse leaders - to step up onto Boards. I believe: Board directorships are a privilege, to play your part in making the community a better place We need diversity of thought, background, ideas and demographics, now more than ever on NFP boards If you are committed, open to learning and passionate, you can serve on an NFP board! I love the medium of online - it allows me to be creative in shaping inspiring resources that anyone can access at any time. My aim is to bring the topic of board leadership alive with engaging resources to share my knowledge and passion! This program brings together: board governance knowledge and resources inspiring board director interviews from across Australia insight personal development resources to build your leadership practical challenges to help you get your first board directorship But more than this, the Board Ignition Course is the opportunity to build a community of leaders who are keen to give their greatest talents in service to a better world. Launch Month Offer Join in June 2017 and receive the following benefits: 1. Your own signed copy of the Book, Difference Makers: A Leader's Guide to Championing Diversity on Boards We will post you a copy of this inspiring read written by Alicia Curtis and Dr Nicky Howe based on their experience supporting young professionals to join Not-For-Profit boards. 2. Seven Deadly Sins of Meeting Facilitators Ebook Improve your meeting facilitation skills by avoiding these common meeting mistakes. This practical ebook is jam packed with ready to use strategies. 3. The ESSENTIAL Governance/Leadership Reading list Don't know where to start? Get my essential list of books to learn more about board leadership and governance. 4. PLUS an invite to a LIVE WEBINAR on the 5 Biggest Myths of NFP Board Leadership Alicia Curtis will be facilitating a webinar on the 5 myths of NFP board leadership ONLY for those who have signed up in June 2017. Enrol now to get instant access to the course. Still got questions? Read the course information page here. I've worked with hundreds of young professionals who are keen to step up onto a Not-For-Profit Board. Many of these young professionals are motivated to contribute their skills, give back to the community and develop themselves as leaders. These people often have many questions: Is a board position really for me? What am I really getting myself into? Do I have anything of value to contribute in the boardroom? How do I get my first board directorship? I've heard from and spoken to young professionals all across Australia who are keen to develop their board directorship skills and find their first appointment. The Board Ignition course is now a resource collating all my experiences in the Not-For-Profit sector and supporting young professionals take their next step onto a board. Who is the Board Ignition course for? Are you keen to give your time, talent and networks to assist a good cause as a board director? This course is perfect is you are: A life long leaner and interested in serving the Not-For-Profit (NFP) sector Keen to explore the key responsibilities of NFP directors Interested in capturing your unique value proposition for a NFP board Ready to learn strategies to get your first board appointment Open to developing your personal leadership skills What this course is not? This course is not: An accredited board governance program (although we do recommend some in the course!) A face to face program (No! You can be based anywhere and access it!) A board matching process (Don't worry, we'll give you the best advice to find a board role!) What's included in the Board Ignition Course? There are eight modules included in the program: Why join a community board? Are you board ready? Your board leadership Finding a board position Before joining a board Inside the board room First time on a board - what to expect? The journey of an outstanding board director Each module includes: Module welcome and an online workbook Video interviews with an experienced board director including summary notes and reflection questions Practical challenges to spur you into action Further resources including videos, blogs and reports See inside the modules here - The course fee gives you 12 months access to all the course resources. Launch Month Offer Join in June 2017 and receive the following benefits: 1. Your own signed copy of the Book, Difference Makers: A Leader's Guide to Championing Diversity on Boards We will post you a copy of this inspiring read written by Alicia Curtis and Dr Nicky Howe based on their experience supporting young professionals to join Not-For-Profit boards. 2. Seven Deadly Sins of Meeting Facilitators Ebook Improve your meeting facilitation skills by avoiding these common meeting mistakes. This practical ebook is jam packed with ready to use strategies. 3. The ESSENTIAL Governance/Leadership Reading list Don't know where to start? Get my essential list of books to learn more about board leadership and governance. 4. PLUS an invite to a LIVE WEBINAR on the 5 Biggest Myths of NFP Board Leadership Alicia Curtis will be facilitating a webinar on the 5 myths of NFP board leadership ONLY for those who have signed up in June 2017. Enrol now to get instant access to the course. Still got questions? Read the course information page here. Launching the Board Ignition Course! I know, I know, you're eager to join a NFP board. But before you say ‘yes’ straight away to the board that’s just offered you a position, have you done your due diligence? What is due diligence? The dictionary definitions go something like... • Action that is considered reasonable for people to be expected to take in order to keep themselves, others or property safe. • The details examination of a company and it’s financial records, done before becoming involved in a business arrangement with it. You must ascertain whether the board role is going to be a great decision for you, the board and the organisation. Accepting a board role is a long term commitment so ensure you understand the expectations, role and people so it’s a good fit for you. Here are 10 questions to ask a prospective board to help you understand whether the board position is a right fit for you. Ready for it? Here we go. 1. What are you looking for in a director? Does your knowledge, skills, networks and time available fit with what the board is looking for? You want to make sure this is a long term commitment and confirm you are not only a good match, but the perfect one! 2. What’s the commitment expected? A board will have Terms of Reference or Board Charter which defines the roles, responsibilities and processes of the board. This might be a good place to start researching and ask any questions you may have. You may also want to see a copy of the constitution too. Think about the time involved, meetings and preparation, any networking or fundraising you need to commit to and get a sense of the annual cycle of activities. 3. Tell me about the current directors - what are their roles? How long have they been on the board? You want to get a good sense of the culture of the board. Are the current board directors active, interested and involved? Do they turn up on time and prepared for the meeting? Are they open to new ideas? Are they people you respect and maybe even admire? You will be working pretty closely with your fellow board directors so check them out and make sure it’s a good fit. 4. Does the organisation have a strong vision for the future and a strategy to achieve it? Does the organisation know where it’s headed? Does it have a clear picture of where it wants to be in 1, 5 or 10 years time? What’s the current strategy to get there? You may also want to see the minutes of previous meetings to see if the discussions at meetings are aligned with the organisation’s vision and strategy. 5. What’s the current financial position of the organisation? You will want to see the financial statements to see the financial health of the organisation. You want to make sure the organisation is solvent, has stable income streams and a clear budget, and have processes in place to review the financials regularly. You may also want to confirm what checks and balances are in place to ensure the validity of the information that is being reported to you as a board director. 6. Does the organisation have the appropriate insurances? This can include insurance for the organisation as well as insurance to cover you as a director including Directors liability insurance, professional indemnity or fraud insurance. Confirm what levels of insurance is offered to board directors and if you must contribute to helping pay for it. 7. What’s the relationship between board directors and their stakeholders? Organisation employees, politicians, funding bodies and end users – there are many types of relationships that board directors might have with the stakeholders of the organisation. Who are the stakeholders and what are the expectations of each of these relationships? 8. What’s the induction process for new board directors? Ok, so you’re getting closer to making a decision, what’s the next steps look like? You will want access to all the board documentation, meet the staff and perhaps tour the facilities. If you’re a younger or less experienced director, you may want to be teamed up with a board mentor if possible to debrief board meetings to help expedite your learning journey. 9. Is there an evaluation process in place? How do board directors evaluate their own performance and as a team? Is there a culture of learning and improvement? To be honest, some organisations might not have this in place, but it might be a great point to highlight in your discussions with them. 10. What resources are there to support me as a board director? Training – formal or informal, ongoing mentoring, staff support or an honorarium may be offered to support board directors in their role. It’s a good idea to know what support is offered from the start and how it can be best used to support you in the role. What other questions could you ask? This list is a good starting point and definitely not an exhaustive list. You may have other questions depending on the organisation or the role. The point is not to take on a board role lightly, take your time and consider if it’s right for you. This will benefit you and the board in the long run. Now over to you: Does it seem like the organisation is a fit? What are your thoughts? I'd love to hear them! Before you read further take a moment to estimate how many hours a week/month a role on a NFP Board involves? What would be your guess? Serving on a community board is a wonderful opportunity. When you find the right board role for you, it should energise you despite the time you devote to it. It may energise you through the tasks you are completing, the people you are working with (your fellow board directors) or the impact you are creating. Let’s face it though, it’s really important to understand exactly the hours involved in a NFP Board position before you accept. The true answer to the time questions above is that it depends on the board, role and organisation as to many hours you need to commit. However let me break down what the commitment could look like so you can get a sense of the components of a board role. Board Meetings Most Boards would meet either monthly, every second month or quarterly from 2 hours to 5 hours each. This would be your core responsibility to prepare, meet and participate. Most board meetings might require this same time again in preparing for board meetings by reading the board papers, thinking through decisions and questions. You may pose these questions to the CEO or staff before a meeting or let them know that you will ask these questions at the meeting. You may also need to prepare reports for the meeting yourself such as Sub Committee reports, Board papers with an idea or suggestion, or you may have prepared a piece of work for the Board’s consideration such an update to a policy document. Board meetings are the foundations of your board responsibility so attendance at each and every one is critical. Sub Committee Meetings Most Boards have Sub Committees that you would either lead or play a role in to support the Board in the work that’s required. These Sub Committees have their own Terms of Reference and meetings can occur sometime occur less often than a Board meeting for 1- 2 hours. These Sub Committees could include Governance, Audit and Risk, Financial/Budget, Fundraising, Board Nominations, Clinical Governance and Marketing and Communications as examples. Sub Committees are used to delegate work by the Board so they can focus their time at Board meetings. Sub Committees can provide information and make recommendations to the Board for action that’s needed. Annual Strategy Session/s Most boards may have a separate session focused on reviewing the strategy. This could involve a day or two to review the current strategy, monitor progress of the strategy or develop a new strategy. It may be an off site event where the board travels to a different location. There may also be a number of meetings to prepare for the annual strategy session too. Leadership Responsibilities If you hold any leadership responsibilities (Board Chair, Secretary, Treasurer, Sub Committee Chair), this will involve further hours to prepare, connect with staff or your fellow board members. Preparation could include developing reports, agendas, work with the CEO or gather information for the Board papers. And let’s not forget emails too – this is a responsibility of all board directors! Representation You may be called to represent the board at further meetings and events. This could include meeting various stakeholders, speaking at events on behalf of the organisation, attending networking events or meeting with donors. Social Activities Many organisations have a range of social activities that board directors can or must be involved with. This may give board members an opportunity to meet and speak with staff, members or recipients of their services. This could include Christmas parties, National Volunteer Week or an annual awards celebrations. Some boards may share dinner together before or after a board meeting too. So how much does this equal to? So a Board commitment could be anywhere between one to four days a month. This would mostly be done outside of normal working hours. In fact, in a previous Australian Institute of Company Directors NFP Governance Report, it suggested that most NFP Board members contributes 35 days a year to their board position. 35 days per year is just under 3 days a month. So how does that sit with your expectations? Surprised at the commitment? Ready for the commitment? It’s definitely good to know what you’re in for! Having coached many young professionals seeking board positions, I can tell you the biggest barrier holding many people back….and no it’s not their skills, their networks, their experience or their education. What is it? It’s their own personal belief that they have no value to give. I can't tell you how many people tell me they are worried they might not bring enough value to the boardroom. I admire their humility and it is often the most amazing leaders who show this humility too! How common is this? In the Board Ignition online course, I have interviewed some super experienced directors from around Australia. I wasn't surprised to hear that Dr Sue van Leeuwen had also experienced this hesitation by prospective board directors. By the way, Dr Sue van Leeuwen is an inspiring business and community leader with 25 years experience on a range for boards. Listen to her articulate the problem and what she suggests to aspiring board directors. https://vimeo.com/228192785 So as Sue says, say yes! Be aware, connected and interested. Ask questions, do your homework AND get ready to learn and work hard! Board directorships can be the BEST leadership learning experiences" So how do you overcome feelings of self doubt? 1. Clarify what you bring to the table In the Board Ignition online course, we have a process to understand your board value proposition. This includes your professional skills, networks, education, passions and strengths. We do a lot of thinking about the value you bring, so it's clarified in your own mind, it's easy to communicate this to a prospective board and once you get onto a board, you can begin being a proactive board director from day one! 2. Surround yourself with the right people Ask experienced board directors or mentors for feedback on your skills and what you can do to become highly valued in the board room. Most of the time, it's easier for other people to see the value that we can offer so having a mentor highlight this for you is priceless! 3. Do the work Yes you may have value to offer but you might need a little work to connect all the dots!! Learn more about the Not for Profit sector, board governance and board leadership. Develop your network and build your own self awareness about how you are perceived in teams. Don’t let a lack of confidence get in the way of your board journey. Are you ready for your first Board appointment? Check out our Board Ignition online course - a 8-module self paced online course designed to fast track your journey to your first board appointment. Enrol now to get instant access to the course. Still got questions? Read the course information page here.